The estate agents Immobiliare Tre Laghi is set in Castiglione del Lago, in Umbria, on the border of Tuscany, in particular between the provinces of Perugia, Arezzo and Siena, near lake Trasimeno, lake Montepulciano and lake Chiusi. We do out job of mediating for the buying and selling of property with great passion and honesty. Our clients are both italian and foreign and we work with italian and european agencies. We offer assistance up to the deed with the Notary, taking into consideration all aspects regarding the buying and selling process, and if necessary even after that. If you are a client from abroad, language is not a problem, we speak english and can provide you with all the explanations you will need regarding the process of buying a house in Italy. Serena works as an estate agent since 2005, she has a degree in languages and foreign literature, she speaks fluent english and also takes on the role of interpreter for the deeds and contracts of purchase. Alessandro works as an estate agent since 2007, he has a degree in Economics and management of tourist services. He will show you around the area and will be available to help you with any information you may require about the local services. 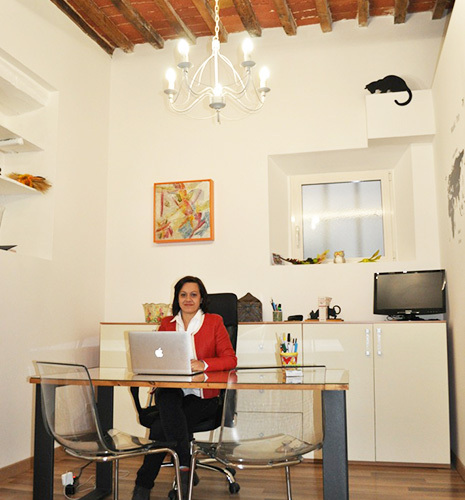 We both have an excellent knowledge of the area, we take care of paperwork and will be there to help you take care of any bureaucratic problems you may encounter in the process of buying a property in Italy. We use the help of local experts such as builders, surveyors, lawyers and Notaries. The estate agents Immobiliare Tre Laghi is registered on the roll at n. 1415 at the Chamber of Commerce of Perugia and is in association with FIAIP at n. 23341 - Federazione Italiana Agenti Immobiliari Professionali (Italian Federation of Professional Estate Agents) – the most important organization of estate agents. The agency fee is 3% plus VAT (I.V.A.) 22% on the price of the property and is payable at the signing of the preliminary contract.